For nearly seven full decades David “Panama” Francis was a professional drummer and for most of that time he was one of the most highly respected and constantly busy sessionists in all of music, playing in every conceivable style behind a host of legendary names from all corners of the musical kingdom. If there was a music heaven Francis would undoubtedly be on the short list of names who’d be in demand to fill the drummer’s chair in the house band of the great beyond. David Francis was born in Miami, Florida in the waning days of 1921 and by the time he was eight years old was drawing raves for his playing and was earning money in nightclubs as he entered puberty at thirteen. By 1938 he’d moved to New York where he was technically too young to legally play in the venues he was playing nightly behind saxophonist Tab Smith and got his name “Panama” from a hat he happened to be wearing one day. By 1940 he was ensconced in Lucky Millinder’s crack band and in the years leading up to the birth of rock ‘n’ roll in 1947 Francis was a mainstay along fellow-future rock notables Sam “The Man” Taylor, Bill Doggett and Big John Greer, backing the likes of Wynonie Harris and gospel legend Sister Rosetta Tharpe. Francis got the opportunity to cut tracks on his own by 1949 where he teamed with Taylor, who’d himself go on to be the most prolific studio saxophonist in all of rock during the 1950’s, and while their work under Francis’s name included sides that fit loosely under the rock banner they were also trying out a wide variety of other styles, none of which connected commercially. During this time Francis joined Cab Calloway’s band and while he was no longer the trend setting star as he’d been during his 1930’s heyday, Calloway still was a popular live performer with an acclaimed stage show. But by the early 1950’s it was evident throughout the black music world that rock ‘n’ roll had taken over the charts and thus was commanding more and more of the record companies interest as well. Since unlike jazz which had subsisted on self-contained big bands rock music outside of purely instrumental groups typically featured solo singers or vocal groups being backed by session musicians in the studios. Francis, adaptably to any style called for, slipped effortlessly into this role and became one of the more sought after studio players in rock for a decade or more. Though most general information websites listing Francis’s credits on rock hits have notable (and easily documented) errors about what he supposedly played on, the true list of his credits is nevertheless staggering, running the gamut of stars and styles, from the genteel Platters to the wild Screamin’ Jaw Hawkins and a host of Atlantic artists from Ray Charles and Big Joe Turner to LaVern Baker and Chuck Willis, which reflected his habit of generally sticking to New York studios. 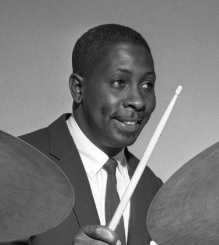 That also accounts for two unusual credits, one behind Buddy Holly (on “Early In The Morning”) after he’d split with The Crickets, and another backing James Brown on “Prisoner Of Love” with a huge studio orchestra in NYC, one of the few times Brown didn’t use one of his succession of legendary drummers on a record. Francis meanwhile was still doing jazz dates, pop and even film soundtracks resulting in some massive hits in those realms. He continued doing rock sessions through the mid-60’s behind such huge names as Solomon Burke but by this point he was gigging behind Dinah Shore and as studio work became less ubiquitous in rock ‘n’ roll he began gravitated back towards jazz. By 1979 he had revived the 1930’s group The Savoy Sultans with original member saxophonist George Kelly, which back in their heyday had ruled the famed Savoy Ballroom. Francis drew widespread acclaim and two Grammy nominations for his work with them by replicating the styles of the music of his formative years as a professional. After receiving the prestigious Pioneer Award from The Rhythm & Blues Foundation in 1993 and playing in a Madonna video the following year Francis’s career wound down and he passed away at 82 years of age in 2001.